The University has also seen a dramatic rise in its position for research in the world rankings, climbing 273 places in the last year from 522nd to 249th place. This positions Northumbria firmly within the global upper quartile for research citations. The World University Rankings rate a total of 1,258 institutions worldwide for teaching, research, citations, industry income and international outlook. The auditors use 195 separate data points to analyse the performance of the world’s leading universities. Northumbria’s improvement from last year’s world rankings, in which it was featured in the top 501-600, is due to a significant increase in the University’s score for Citation Impact. This measures how often research originating from the institution is cited elsewhere and is a sign of its impact and quality. Northumbria’s score for this metric increased by a notable 28.4 points, recognising both the increased output and quality of research coming from the University. Metrics analysing the ratio of papers to academic staff, and co-authorship of papers with international partners also saw sizeable increases for Northumbria. This is evidence that academics are actively undertaking more research, especially with scholars from other universities worldwide. Northumbria University has invested significantly in recent years to provide staff and students with world-class new facilities for research and teaching. This has included new laboratories and equipment for those working in science, technology, engineering and maths subjects and the development of two new buildings for those in the computing, information science and architecture disciplines. Both buildings will open for teaching during this academic year. 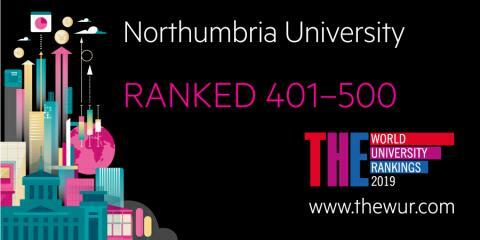 Northumbria’s success in today’s Times Higher Education’s World Rankings follows the publication of The Times and Sunday Times Good University Guide last weekend, in which it was rated as the best university in the North East of England for student experience. Ninety-eight UK universities are listed in Times Higher Education’s world rankings. Northumbria is the 48th highest ranked UK institution, which is comparable with its position in the most recent The Guardian university league table.